Having abundant natural resources nearby is a huge advantage, from the Saudis getting mad rich off their oil, to the Yankees using their farm system to grow money trees. For a restaurant leveraging its own resources, hit up Manzo Ristorante. 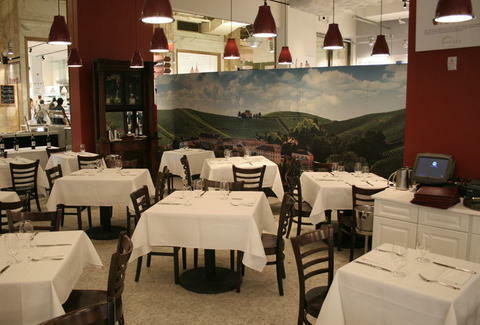 The only white tablecloth option in the new Italianate shrine, Manzo's scooping the choicest ingredients from the market's horn-of-plenty and delivering it to the Batali protege helming the kitchen; the marble topped bar and modestly sized, red pillared dining area're separated from the bustle by a giant mural of the Italian countryside, now playing the backdrop the backdrop to your own spaghetti western. The vast menu covers its bases with antipasti (vitello tonnato, five preparations of Piemontese beef), mid-course servings of Tortellini di Robiola (w/ chanterelles & pancetta) and tripe-studded fettuccine, and mains from hay-smoked veal chops to fried quail w/ stuffed peppers, which definitely isn't what the Bears paid $91.5 million for. There're also two regionally-inspired tasting menus: the three-course Parmigiano Reggiano, including pappardelle w/ sausage & radicchio, and lardo-topped carpaccio; and the four-course Liguria, busting with walnut-sauced sea bream and a rabbit saddle stuffed with olives & farro, so delicious, when you look up your credit card statement, there's no risk of feeling e-gypped. As manzo means beef, there's even a six-course run of the stuff repping calf's brain mezzalune w/ oxtail ragu, grilled beef heart and tongue skewers, and a Dickson's Farmstand "Lifter Steak" w/ bone marrow marmalade and trumpet royales, though considering their farm grows players for other teams, they shouldn't be tooting their own horns.